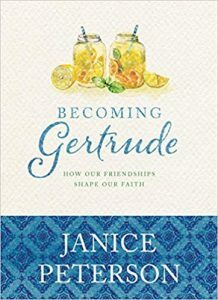 COLORADO SPRINGS, Colo. (October 30, 2018)—NavPress announces the November release of Janice Peterson’s debut book, Becoming Gertrude: How Our Friendships Shape Our Faith, detailing the important role of spiritual friendship in faith formation. Every person who visited Eugene and Jan Peterson at their cabin on Flathead Lake in Montana arrived eager to talk with Eugene—and returned talking about the warm kindness and feisty wisdom of Jan. Living a quiet life of service and hospitality behind the scenes, Jan Peterson has spent her years showing spiritual friendship and gospel love to the people around her. In Becoming Gertrude, she shares her story for the first time, offering insights into friendship, service, and hospitality. For media inquiries, please contact Katie Dodillet at Tyndale House Publishers, katiedodillet@tyndale.com. The NavPress mission is to advance the calling of The Navigators by bringing biblically rooted, culturally relevant, and highly practical products to people who want to know and love Christ more deeply. Through The Message Bible and other insightful resources, NavPress seeks to bring positive spiritual movement to people’s lives. In January 2014, NavPress entered into an alliance with Tyndale House Publishers to strengthen and better position NavPress and its rich content for the future. NavPress provides books and other content that bring spiritual impact and life transformation and help lead in the mission of making disciples.